John and Amy Donaldson of Sea Tow Sebastian. SEBASTIAN, Fla. – They met on the water, worked on the water and got engaged under the water. 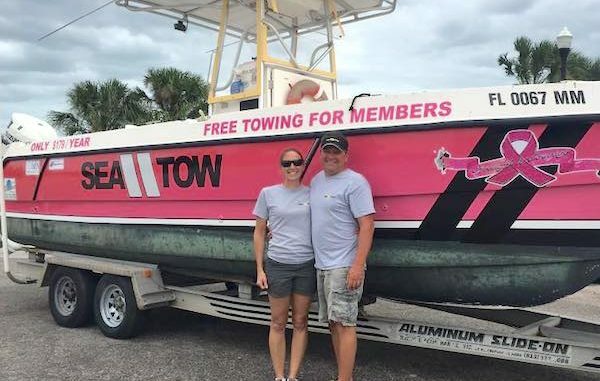 Now, for a little over a year, John and Amy Donaldson have owned and operated Sea Tow Sebastian: a testament to their common love, and more importantly, their love for each other. The husband-and-wife team first met while working on a parasailing boat, and in 2003, they began dating. Years later, while on a diving trip, John proposed to Amy underwater. Since they first started dating – and later getting married in 2007 – John and Amy have been inseparable, both at home and on the job. 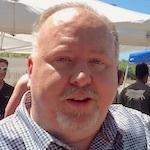 Both have master licenses, allowing them to work together as Sea Tow captains – a job they shared for over a decade before finally purchasing the Sebastian franchise a little over a year ago. “One of the best parts about this job is that we’ve only been apart for any period of time maybe 10 times since we first started doing this,” John said. “We’re best friends and we don’t really want to be away from each other, so it’s been really neat. With two children – ages 9 and 6 – the day-to-day life at Sea Tow Sebastian is truly a family affair. Recently, their son and daughter had a “Favorite Team” day at their school, where students were encouraged to wear their favorite team’s uniforms. The Donaldson kids showed up to school that day wearing Sea Tow shirts. On the operational side of things, Amy spends her days monitoring the phones and radios, and keeping up with the books while John takes jobs out on the water for the business. Since Sea Tow captains are on call 24/7, 365 for non-emergency issues like fuel drops and towing for recreational boaters, there are days when John takes jobs at night. Along with their roles as Sea Tow captains, John and Amy like to spend their time at horse shows, where Amy shows horses and John tags along in support. As they reflect on their relationship and where it has taken them today, Amy adds that they wouldn’t trade what they have for the world. To learn more about Sea Tow Sebastian and the Donaldsons, visit their Sebastian Sea Tow website.